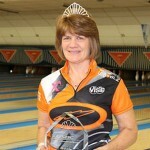 United States Bowling Congress Hall of Famer Liz Johnson of Cheektowaga, New York, added to her legacy Tuesday as she became the ninth bowler in history to win multiple titles at the USBC Queens, a Professional Women’s Bowling Association event. Johnson (pictured) opened the championship match against rookie Erin McCarthy of Omaha, Nebraska, with four consecutive strikes to build a 23-pin lead and never looked back as she cruised to a 256-202 victory at The Ashwaubenon Bowling Alley in Green Bay, Wis.
Johnson claimed the coveted Queens tiara and $20,000 top prize, while McCarthy took home $10,000 for second place. The 2015 event featured a prize fund of more than $125,000. “This is going to sound so cliche, but it’s a dream come true,” said Johnson, who now owns six major titles, including three U.S. Women’s Open titles. USBC Hall of Famers Wendy Macpherson and Millie Ignizio are the only three-time winners at the Queens, while Dorothy Fothergill, Donna Adamek, Katsuko Sugimoto, Aleta Sill, Lynda Barnes and Kelly Kulick all have two titles apiece. 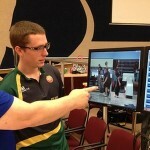 Johnson entered the stepladder Tuesday as the No. 2 seed after falling to McCarthy in the final round of the double-elimination match play winners bracket. McCarthy averaged 261 in her last two matches, including a 795-651 win against Johnson, to earn the top seed for the TV show. On the way to the final, Johnson struck 10 times, including her last four shots, to overcome two splits and sneak past 2006 Queens champion Shannon Pluhowsky of Dayton, Ohio, 234-228. Pluhowsky, the lone left-hander on the show, started her day with a 225-208 win against defending champion Maria Jose Rodriguez of Austin, Texas, denying the native Colombian the chance to become the first bowler since 1982 to successfully defend a Queens title. The southpaw was able to pull away with five consecutive strikes in frames five through nine, while Rodriguez’s undoing was a 4-6-7-10 split in the fourth frame. In the opening match, Rodriguez downed Liz Kuhlkin of Schenectady, New York, 10-9 in a one-ball roll-off after the two tied at 227. Kuhlkin, a two-time national champion at the University of Nebraska, needed three strikes in her final frame to advance but left a 10 pin on her final offering. She left another in the roll-off, allowing Rodriguez to advance. This week in Green Bay, more than 200 players bowled 15 games of qualifying over three days to determine the 63 bowlers who would join Rodriguez in the double-elimination match-play bracket. 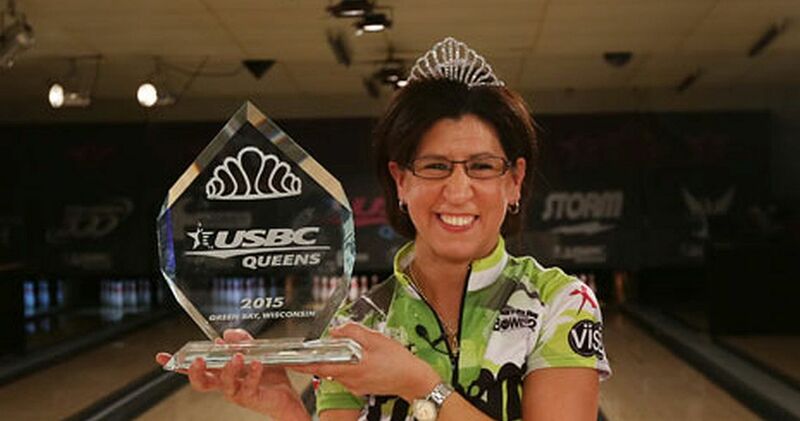 The Queens was the first event of the 2015 PWBA season. The Tour re-launched this year after a 12-year hiatus. The next event is scheduled for July 9-12 in Sacramento, California. “I’m just very honored and humbled to be in the position, but I’m not done yet,” said Johnson, who was inducted into the USBC Hall of Fame earlier this year. Championship Match: Johnson def. No. 1 McCarthy, 256-202.